It is sometimes hard to remember that our smartphones are also phones. With all the internet enabled calls, messages and video chats the standard method of remote communication takes the inevitable backseat. The best Android and iOS contacts apps have adapted too, instead of just giving you names, addresses and phone numbers they are starting to offer more functionality. Because of the clutter in both of the App Stores these days, it is quite difficult to find the app that you need. Don’t worry, we’ve found a few phonebook apps but none of them really impressed us like the one we’re about to present to you. The app that we loved so much is called 1code, a revolutionary productivity tools which allows its users to share contact information and schedule meetings in a faster, easier and less stressful way. The main idea of the developer team was to create an app that will solve our problems of exchanging contact information and believe us, they had an enormous success. They focused on creating efficient, convenient and simple solution, designed with clean user interface and easy to use features. 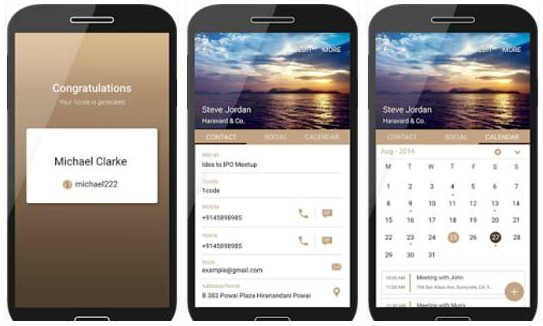 1code is a smart phonebook and revolutionary calendar. If you want to simplify the way you share, organize, update your contact information and set up meetings with your contacts this is the perfect way to do it. All you have to do is download the app, choose your name an existing Gmail, or twitter username as your 1code and start sharing it in person or virtually. Share your contact info with anyone you like, receive theirs and change your contact info (your selected group of contacts will have the updated information automatically). You can also share your calendar with anyone you want, so they can always know when you are busy and free.